I haven’t been this happy to see a Friday in a long time! I know I am happy it’s weekend and I am sure you are too? Have any plans? This is 2 coats with no topcoat. This light grey creme has a beautiful formula and fantastic opacity. It’s not even streaky. This is 2 coats with no topcoat. This is a silver glitter with light blue glitter. Looking at the photo I could’ve added a third coat. I get great coverage from this glitter. It is a little bit gritty when it dries on it’s own but with one coat of topcoat it is super smooth. This is 2 coats with no topcoat. A light blue creme with great formula and opacity. What do you think of my skittle? Do you think it works? I just wanted to give you a fair warning. It is about to get very busy here in OrdinaryMisfit land. I have decided to tackle the 31 day challenge this year. Yup that means a post every single day for 31 days! Here are the prompts if you are interested in joining in. If you just want to follow along to see what everyone creates you can follow the hashtag on all social media platforms. 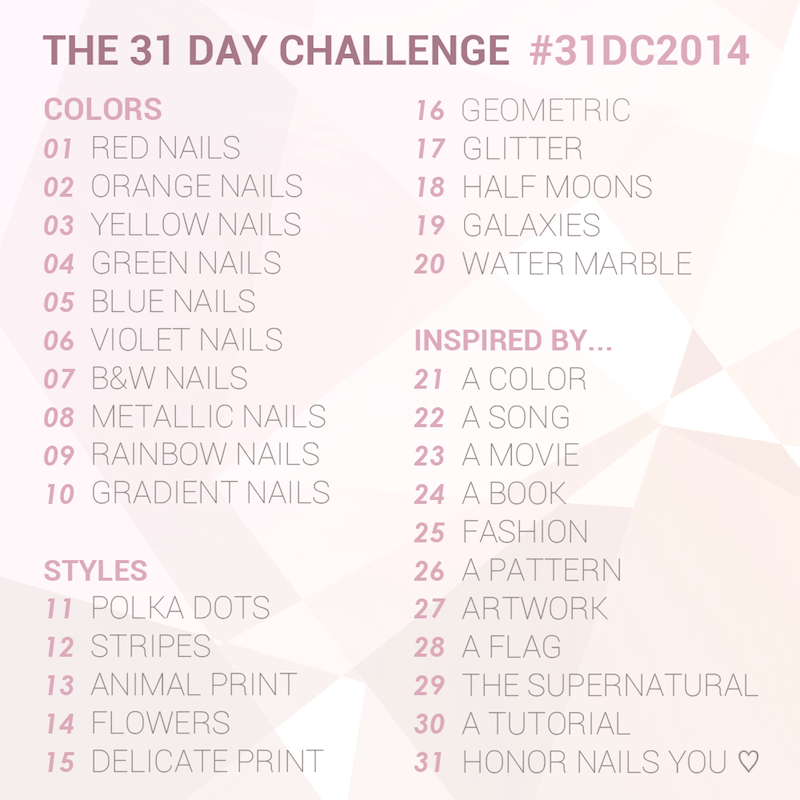 #31DC2014. There there are still the Tuesday Stamping posts which will continue throughout. Every Tuesday will have 2 posts. I also have my birthday giveaway starting on Monday and an amazing book review coming up next week. So there will be a few days of double posts but you don’t mind do you? Have a great weekend folks. It’s the last one for August. The new week brings with it a new month, a new season and a new challenge. LOVE this mani! Too pretty! Also, some of the topics for the #31DC2014 look awesome… I don’t have the attention span to do the whole thing, but I may steal a topic or two. Yay! That would be awesome! I am looking forward to seeing which and what you come up with. This is a great skittle! Love it! LOVE your skittles! I know what you mean, though, about just not always having the ideas to put it all together, haha…but this worked perfectly! Meep! Thank you so much. I’m nervous! !